Vandna is an Associate Professor in the School of Social Work at McGill University and leads the Children's Services Policy Research Group. Please read Vandna's About page for more information on her work. Ashleigh Delaye (MA 2013, MSW 2017) is a research associate in the Centre for Research on Children and Families and the Children’s Services Policy Research Group. Her research interests pertain federal policy for First Nations health and social services, fiscal inequities in services for First Nations children, the decolonization of health and social services, intergenerational trauma, community-based support services for children and families, child protection systems and out-of-home placement trajectory, and the relationship between chronic poverty, the lack of community resources, and neglect investigations. She has worked on projects relating to community’s role in child welfare, First Nations child welfare and fiscal policy, out-of-home placement trajectories, poverty and social spending, and psychosocial impact on children and families living in jurisdictions lacking community resources and services (service deserts). Ashleigh is also a social work practitioner in the hospital setting. Kathryn is a Joint Law and Social Work student supporting the First Nations Health Consortium project as a Research Assistant. Kathryn has previously worked as a policy analyst for the Ontario Ministry of Health and Long-Term Care in the eHealth Policy Branch and the Mental Health and Addictions Branch, where she coordinated stakeholder engagement activities, provided secretariat support to provincial advisory bodies, and developed cabinet policy submissions. Kathryn holds a Bachelor of Science from Queen’s University with a Major in Biology and a Minor in Health Studies (2014). Kathryn’s research interests include social policy, health and social inequalities impacting First Nations communities, and mental health and addictions. Rodney is a first year Social Work PhD student at McGill University. He holds a Master of Arts in Governance and Civil Society from the University of Osnabrueck,Germany(2014), and a Master of Philosophy in Social Work from the University of Ghana (2011) . 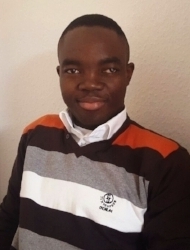 Rodney has previously researched how formal and traditional protection arrangements affect the care of Orphans and Vulnerable Children (OVC) in Ghana. His current interest is in investigating the barriers vulnerable children face in accessing educational opportunities, and how extant protection policies and programmes facilitate equality in the educational sector for vulnerable children in Developing countries. Tyson is currently completing the Master of Social Work program at McGill University. He has a Bachelor of Social Work from the University of Northern British Columbia (2016). Tyson joined the CSPRG as a Research Assistant in the fall of 2017, focusing on a formative evaluation of the newly founded Alberta First Nations Health Consortium, and the implementation of Jordan’s Principle. Before coming to McGill, Tyson worked as Harm Reduction Worker in an overdose prevention site in his hometown of Victoria, British Columbia. Prior to that, he worked as shelter/outreach worker for the Prince George Native Friendship Centre. His interests include harm reduction as a form of social work practice, reducing barriers and bureaucracy to accessing services, substantive equality, primary interactions with services, as well as public and agency-level policy. Leah started working for CSPRG in April 2018. She is assisting in the dissemination of research related to Indigenous child welfare. Leah’s research interests include social and environmental justice, as well as social policy and advocacy. Leah is a current Master of Social Work student at McGill University and holds a Bachelor of Arts degree in Psychology and Women's Studies from McGill University (2015). She has experience in community activism and programming, working in several Montreal-based organizations. Hannah Warren joined the CSPRG in May 2018 as a research assistant supporting a project to enhance the understanding of front-end child welfare practices in Indigenous agencies and to identify factors that support and challenge development of practice models that meet the needs of Indigenous children and families. Hannah holds a Human Relations degree from Concordia University (2016) and is completing her Master of Social Work degree at McGill University. Hannah came to social work graduate studies with 8 years of front-end community practice working with marginalized populations. Portia joined the CSPRG in October 2017 as a research assistant supporting the Alberta First Nations Health Consortium Jordan’s Principle Enhanced Service Coordination project. Currently, she is completing her Master of Social Work degree at McGill University. After completing her Bachelor of Social Work degree at McGill University (2012), she worked in community mental health, journalism, and homelessness prevention outreach. Portia worked as a child protection social worker in the Nakazd'li and Tl'azt'en territories of northern BC. Portia found the child protection system did not meet the needs of First Nations families and she has shared her experience with The Georgia Straight and CBC. Her research interests include First Nations child welfare. Interested in joining our team? Please check our Employment Opportunities page for current openings and our Contact Info page to connect.